TOTAL FLANKER...a rugby blog: Is that all you've got? 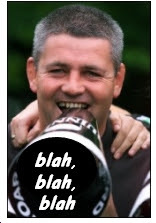 I'm not entirely sure what Warren Gatland thinks he's up to with his public sniping at England. First he suggested that Brian Ashton, by virtue of his rolling contract, didn't enjoy the confidence of his employers at the RFU. Then he stated that Wales would be prepared to turn the match at Twickenham this weekend into a "bloodbath". Next in the firing line was Ian Balshaw, with whom Gatland was "not impressed" - and then came the revelation that Lewis Moody gave away the occasional penalty. As far as "mind games" go, it's all rather pathetic. We all know that only England's performances over the next 12 months will determine how safe Ashton's position is - whatever the length of his contract - and I'm pretty confident that the world and his wife would conclude that if Wales do try to turn Saturday's game into a "bloodbath" then there's only likely to be one winner - and they won't be wearing red shirts. And if you were to ask your average English rugby fan (who, strangely enough, is very rarely a gin-swilling, Barbour-wearing toff - contrary to the tired and dated image still portrayed by lazy Western Mail journos) and he'd be more than happy to point out his misgivings over the selection of Mr. Ballsup and acknowledge the occasional headless chicken antics of Mad-eye Moody. In the words of a quality Australian news publication: "Is that all you've got?" Say what you like about Brian Ashton - and I'd be the first to say that the jury's still out on his capabilities as head coach despite the relative success of the World Cup campaign - but, so far at least, he hasn't indulged in any of this pre-match nonsense when talking about the opposition. Back when it was Clive Woodward v Eddie Jones the pre-match banter was considered to be all part of the entertainment but it's been carried to new levels over the intervening years by the likes of Bernard Laporte, Graham Henry, Jake White and now Warren Gatland and, frankly, it's getting very, very boring. I'm sure that Warren Gatland will turn out to be a very good coach for Wales but I respectively suggest that he shuts up for a minute and let his team's rugby do the talking. unfortunately all that smalltime smack talk will be eulogised into the soon-to-be-written Welsh myth about that game....the version where Wales actually staged a magnificent comeback that was all part of their gameplan all along. "I'm sure that Warren Gatland will turn out to be a very good coach for Wales but I respectively suggest that he shuts up for a minute and let his team's rugby do the talking."